The brands we researched for the best reviews were: Astrabeds, Essentia, FloBeds, Habitat Furnishings, Ikea, Savvy Rest, and Sleepez. 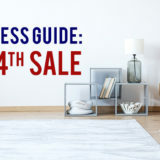 Each offers their own set of pros and cons that buyers should be aware of when mattress shopping. In this comparison, we will look at several aspects of each line, including owner satisfaction, mattress features, and retailer policies. In addition to summaries of each brand, all of the results are compiled in table at the end of the article for easy comparing. Astrabeds offers a 100% certified-organic, natural mattress, priced at $1,999 for a queen size. The 10″ profile height includes one inch of wool in the cover, and firmness levels are customizable. Their mattresses do not contain any synthetic fillers, adhesives, or other toxic chemicals. Astrabeds also offers a 90-day refund/exchange period and 25-year prorated warranty (10 years full coverage). Each mattress features a 100% organic cotton covers (OCS certified), wool fire barriers, and Eco-Institut certification. In verified owner reviews, Astrabeds’ mattresses receive an average 95% satisfaction rate with reviewers mentioning comfort, support and durability as pros, though some complained about shipping speed. Essentia touts their beds as “natural memory foam”, though they explain it is made of latex (copy is fairly vague about how this differs from other latex materials). They utilize both their proprietary natural latex material and 100% natural Dunlop latex, and offer six models of latex beds priced from $1962 to 6754. All offer medium to medium-firm support, with profile heights varying from 6 inches to 8 inches. Essentia beds feature organic cotton covers, adhesive-free designs, and are certified free of harmful chemicals. The brand offers a 20 year warranty (10 years full coverage) and a 60 day refund or exchange period. In reviews on their website, they do not use a verified review system or a star system (text only reviews). On other websites, they tend to average about 83% in owner satisfaction. People find the beds to offer good support and pressure relief, but complain about the inflated prices and lack of firmness/thickness options. Flobeds offers two lines of mattresses made of latex; one traditional line with blended Talalay latex and one organic line with 100% natural Talalay latex and organic covers, each in three models. Profile heights range from 7.5 to 11 inches and mattresses are free of adhesives. Flobeds offers a 20 year prorated warranty and 100 day return/exchange period. On their website, they only offer testimonial-style reviews (non-verified) and no star ratings. On third party sites, the brand averages satisfaction ratings of around 80% with the most recurrent complaints involving impressions/compression of upper layers. 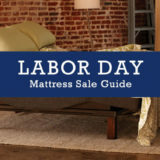 Habitat Furnishings offers three models of natural latex mattresses with a mix of Dunlop and Talalay latex. The beds feature no synthetics or fillers and have optional cotton covers with wool fire barriers. They come in six, eight, and nine inch models, with medium to firm feels. Habitat offers a prorated 20 year warranty and 365 day exchange or refund with a $75 fee. The website features a verified reviewer system with satisfaction rates between 90-93%. Many mention good things about support and comfort, though the complaints with the beds involve impressions and lack of support, and issues with firmness levels. Well-known furniture discounter Ikea offers two lines of latex mattresses, the Elsfjord and Edsele. The two collections feature fairly low prices ($399-1199), but contain only synthetic or blended Dunlop latex. Currently, there are two models with heights of 5.5 and 7.6 inches. Ikea offers a 20 year limited warranty and 90 day exchange policy but does not accept returns. 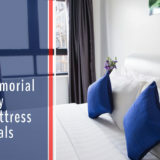 Both beds are considered firm, which is a cause for complaint among owners as is early signs of wear and poor comfort for heavier individuals and side sleepers. The brand does not accept reviews on their website though these two lines have satisfaction rates around 83% on third party websites. Savvy Rest offers three latex mattresses with different combinations of organic Dunlop and natural Talalay latex. Their beds are not glued and can be customized in terms of layers and firmness. Prices range from $1369 to $5829 depending on the number and type of layers. Savvy Rest offers a 20 year limited warranty and 90 day exchange period (no returns). Their website does not allow reviews, but from what we could find on third party websites satisfaction tends to be about 78%. While people reported comfort and motion isolation, the lower score was affected by complaints of price, value and durability. SleepEz offers two collections of latex beds,each with four models. The natural collection features Talalay blended latex or natural Dunlop with cotton and wool covers. The organic collection features 100% natural Dunlop or Talalay latex with organic cotton and wool covers. Prices range from $750-2900 depending on the thickness and type of latex. The brand offers a 20 year prorated warranty and 90 day exchange/return period, though fees do apply. The website allows reviews, but there do not appear to many models with reviews to compare. 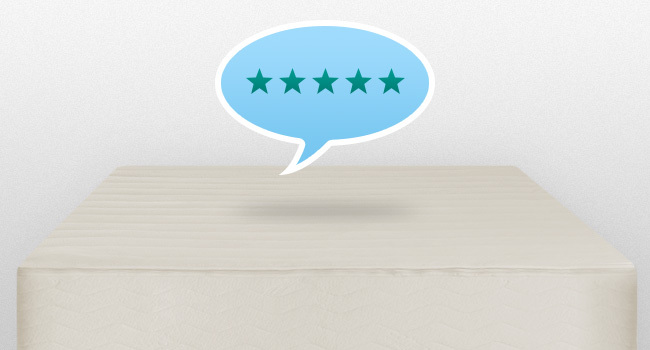 Sleep Ez reviews on third party sites indicated average satisfaction around 70%. People liked the ability to customize, but took issue with firmness, mattress setup, and returns. Phew, that was a lot of research! It took some time to compile all of the little facts and bits of information, but we hope these compilation of latex mattress reviews will help you compare brands in your search for a better bed. We thought it is was interesting that all of the latex brands ranked higher than standard spring mattresses (65-67%), but that considerable variation did exist. It seems that best rated-brands used 100% natural latex, offered customizable firmness/layers, and offered prices in the moderate range. Brands that used blended latex or hybrid models tended to rank lower, as did brands on both the lowest and highest end of the price scale. Based on what we found, the best value appears to be the natural, organic latex mattresses from Astrabeds. 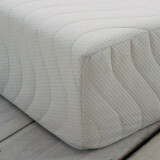 This is based on the 25 year warranty, 90 night hassle free trial, and included organic cotton/natural wool covers. They had the highest owner satisfaction rate, and we did not find any complaints about impressions or durability. As green products continue to trend, many brands are opting for natural bedding because it reduces the issues that go along with mattresses that are created with chemical formulas. The world is becoming more conscious of what impacts the environment, and latex brands are doing their part to reduce their environmental footprint. These beds can be priced somewhat higher than average spring beds, but they come with health and environmental benefits that other mattresses simply do not offer, and are much more likely to result in owner satisfaction. Overall, our look at all of these reviews indicate that latex beds remain one of the best mattress options, and so long as you opt for a natural model with a good return policy, you should be in for better nights and more restful sleep. I just want to say that this was very helpful to my search. I found Plushbeds a bit mysterious as there reviews are nothing but “perfect” When I called there, asking questions the lady said she would get someone which were busy at time, asked for my number and I said I’ll call back at a more convenient time. I have a caller ID number block so my number never shows up. They some how manage to call me back when I never asked for them to do so. Reg Flag to me!! John was a bit pushy and arrogant about some questions. I have searched hard to find bad reviews on this company not doing so till reading your reviews. My instinct has told me to stay away and I since learned about Astrabeds which right now sounds good. I also found a natural latex mattress store called, ” THE NATURAL MATTRESS STORE ” in California that sounds good but you had nothing here on them. Anyways I want to thank you for your informed info on mattresses.